The Medway Swale Estuary Partnership, together with the Medway Valley Countryside Partnership, will be holding a FREE non-native plant & marine species workshop on Friday 8th March, 9.30am – 12pm, at the Innovation Centre. 7-8 Jan Theft of 250 litres of diesel from a boat on a mooring in Faversham Creek. No details of method transport, i.e. boat. 9-10 Jan Theft of an 8′ GRP Dinghy from Strood Pier area. 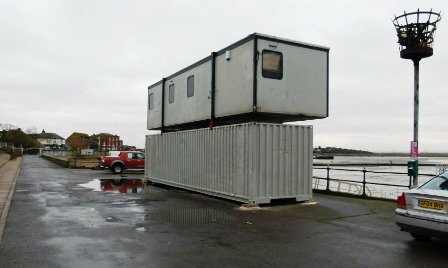 Queenborough Harbour Trust has installed a portacabin on top of a container at Crundells Wharf to give a better view of their moorings than the old harbourmaster’s office in the creek. What next, will they be getting a ladder? If you are interested in this event, please contact me and I will pass on your details.